The GC320 Electronic Predator Game Call and Decoy Combo is lightweight, compact, and easy to operate. For superior predator attraction, this product combines a visible motion decoy with audible sound effects for extreme results. The GC320 Game Call offers an outstanding remote technology. It comes with 24 proven-deadly pre-programmed calls, allows you to play two calls simultaneously, and includes an auxiliary jack for extreme volume requirements. The ICOtec PD400 Predator comes with LED night lights for topper illumination, speed dial control, auto-run capability, intermittent motion modes, and more. Its motor is quiet and doesn’t produce gear noise. It attaches seamlessly to the GC230 to provide complete predator attraction in a compact and easily transportable package. Take advantage of our 300-yard remote range that doesn’t require line-of-sight to stay better hidden from your game. This remote operates both the decoy and the game call, giving you complete mobile control right at your fingertips. 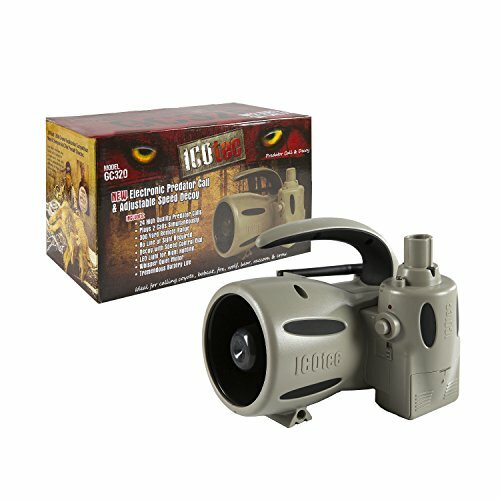 Package includes (1) ICOtec GC350 - Programmable Remote Electronic Predator Game Call and (1) ICOtec PD400 Predator Decoy. Decoy and Game Call each require 4 AA batteries (not included). Remote comes standard with a 12 volt battery (included). Includes 1 year factory warranty. DEAD SERIOUS - The GC320 Electronic Predator Game Call and Decoy Combo is lightweight, compact, and easy to operate. For superior predator attraction, this product combines a visible motion decoy with audible sound effects for extreme results. GC320 GAME CALL - The GC320 Game Call offers an outstanding remote technology. It comes with 24 proven-deadly pre-programmed calls, allows you to play two calls simultaneously, and includes an auxiliary jack for extreme volume requirements. ICOTEC PD400 DECOY - The ICOtec PD400 Predator comes with LED night lights for topper illumination, speed dial control, auto-run capability, intermittent motion modes, and more. Its motor is quiet and doesn't produce gear noise. It attaches seamlessly to the GC230 to provide complete predator attraction in a compact and easily transportable package. INCLUDES REMOTE - Take advantage of our 300-yard remote range that doesn't require line-of-sight to stay better hidden from your game. This remote operates both the decoy and the game call, giving you complete mobile control right at your fingertips. PRODUCT SPECIFICATIONS - Package includes (1) ICOtec GC350 - Programmable Remote Electronic Predator Game Call and (1) ICOtec PD400 Predator Decoy. Decoy and Game Call each require 4 AA batteries (not included). Remote comes standard with a 12 volt battery (included). Includes 1 year factory warranty.